Well, Voices Of Wrestling fans, DDP has been gaining a lot of attention over the past few months after his yoga program has begun to really take off. The program has been backed by WWE superstars like Chris Jericho, and is currently being used by Jake the Snake Roberts to help get his life back in order. The program is getting a lot of positive feed back and even getting to lay claim to some amazing transformations. (if that doesn’t make you cry you don’t have a heart). If that wasn’t enough here’s more. But I decided to take the program and test it out for myself rather than just go by what the critics say. First off, to tell you a little about my fitness background. I am a former NCAA Division 3 Ice Hockey player. So my entire life I have always been an elite athlete. Only recently, May 2012, when I graduated did I really stop training at an elite level full time. To give you a look at my fitness level, earlier in 2012 I completed the Insanity program twice. But it got too repetitious to complete a third time. I looked for something new and for a while had success using the bodyrock program (Another great fitness program), before I decided to start the DDP YOGA Program. My ideal fitness program is something affordable, easy access, challenging, and something that works! So in an effort to mix my work, my love of wrestling, and my fitness goals THEDDP YOGA Program could potentially be a good fit for me. Please Remember- THE FITNESS AND WORKOUT ASPECT ARE JUST 1 PART OF THIS PROGRAM! I HAVE ALSO TRANSFORMED MY DIET TO FIT MY WEIGHT GOALS. My Calorie intake per day to maintain my goal weight of 165 lbs, is about 2500 calories per day. I watch what I eat as much as I can, although I have been cheating a little on holidays and weekends. I am able to get away with it because my metabolism has not yet quite caught up with me. In time it will, so I must enjoy this while I can. Again please remember – EATING RIGHT IS THE OTHER PORTION OF ANY WORKOUT/FITNESS PROGRAM TO MAKE IT WORK! Below the belt / off / fat burner / below the belt/ TOMORROW……. 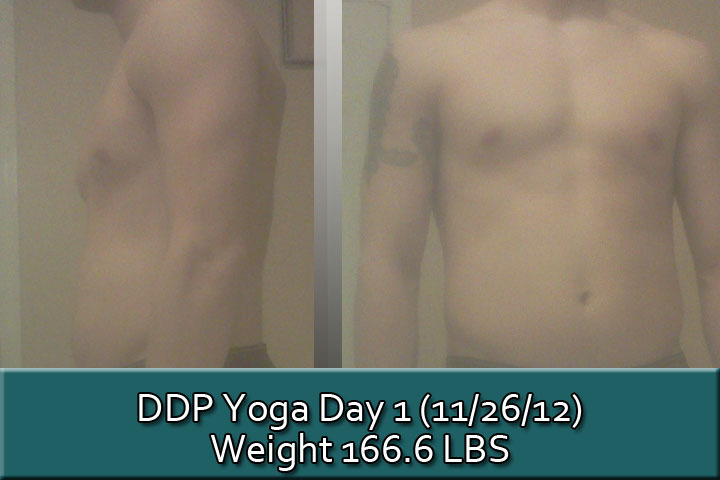 The DDP YOGA program IS a viable way to keep yourself in healthy shape in conjunction with eating correctly. I have not tested my self extensively with cardiovascular activities, so I am not sure of the impact it has had on that portion of my fitness level. As far as my body, I lost a small amount of weight, it has mostly maintained itself. However, I did notice I started to get a little bit more tone. Not really putting on any mass or muscle, but I’m not putting on any fat either which is important. Also, I feel a lot better, just moving around. I played hockey for 17 years, my body was beaten up pretty good. I have a bad back from disk problems, and both of my shoulders have been separated to different degrees. The left on even, a full dislocation just over 17 months ago. If you look at the video I am able to easily shoot up into a bridge position from laying down. That position places a lot of stress on my shoulders, and through time, I was able to quickly and painlessly master it. The program has removed a lot of aches and pains I had from old hockey injuries. I feel a lot nimbler moving around on the ice when I am coaching, and even when moving large boxes in a warehouse where I work part time. I will continue to do this program and keep you updated with my progress. But, in just 30 days, my flexibility has gotten unbelievably better. I never thought I’d be able to touch my toes this easily ever in my life. 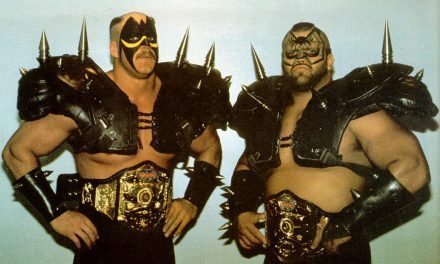 I was always barely able to even touch them without bending my knees. Now I’m working on getting my fist to the floor without my knees bending. So to be quite honest. The DDP YOGA PROGRAM IS A … BANG! Is Kane Being a Focal Point of WWE Payback Ridiculous? What state/area has produced the most Hall of Famers?